CRE grad gets Scholar Award! Caitlin McDonough receives a prestigious Scholar Award from the Philanthropic Educational Organization to support her research on the reproductive tract secretome of Drosophila melanogaster. The NSF has recommended for funding our EAGR proposal to characterize the evolutionary phenomics of Drosophila and to explore of the genomics of biodiversity and adaptation. Approximately 300 species of Drosophila and related genera, including all those maintained by the Drosophila Species Stock Center, will be phenotyped for a set of morphological, behavioral, physiological and developmental traits that collectively capture core aspects of sexual selection and life-history syndromes, in addition to providing characters relevant to ecological selection. In addition to providing the basis for a valuable public database (look to the CRE website for developments! ), the data will be used for two kinds of state-of-the-art comparative analyses. First, Bayesian phylogenetic modeling, applied to data for all species, will be used to evaluate rates of diversification and co-evolutionary dynamics among character states and across the clade using a range of alternative trait diversification models. Second, two complementary analytical approaches will be applied to all Drosophila species with fully-sequenced genomes to explore genotype-phenotype relationships for all traits, with the goals of identifying candidate genes underlying trait diversification and setting the stage for studies of the molecular evolution and genomic architecture of Drosophila biodiversity. Members of the Center for Reproductive Evolution and SU Biology have been involved in leading a science outreach program at the Westcott Community Center titled “Bridging Communities to Improve Proficiencies in Science,” funded by the Society for the Study of Evolution and the CRE. 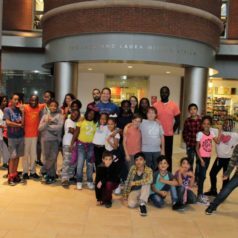 Each week faculty, postdocs, graduate, and undergraduate students engage with school-age students at the center providing opportunities for the participants to experience doing hands-on science experiments that mirror what is happening in labs around the university. 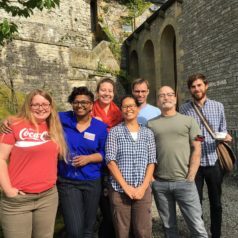 CRE members Gress, Pitnick, Dorus and Lüpold travel to Castleton, Derbyshire to investigate differences in the intensity of sexual selection on male body size of Scathophaga stercoraria, between sheep and cow pastures, before attending the 14th biennial Biology of Spermatozoa meeting. New NIH Award to the CRE! Our research proposal to use proteomics to investigate sperm modification within the female reproductive tract of Drosophila melanogaster was just funded by an R21 grant from the National Institutes of Health (Male Reproductive Health Program, Fertility and Infertility Branch). This project complements the evolutionary research funded by our recent NSF, which explores evolutionary divergence and reproductive isolation consequences of these sperm-female interactions. This work is a collaboration between CRE members Steve Dorus, Scott Pitnick, John Belote and PhD student Emma Whittington, along with Mariana Wolfner of Cornell University. We will soon be searching for a Postdoctoral Fellow to join this research program. Please contact us if you are interested. Caitlin McDonough, a CRE graduate student, is a Co-Chair of the Career Development Sub-Committee of the Genetics Society of America. 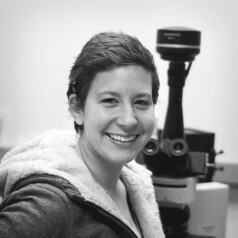 Get to know Caitlin better at the GSA’s Genes to Genomes Blog. Our research proposal to use proteomics to investigate sperm modification within the female reproductive tract, along with its evolutionary divergence and reproductive isolation consequences, is recommended for funding by the NSF. This work is a collaboration between CRE members Steve Dorus, Scott Pitnick, John Belote and PhD student Emma Whittington, along with Mariana Wolfner of Cornell University and Tim Karr of the Kyoto Institute of Technology.